Ingersoll/Goderich, ON January 11, 2019 — The Ontario Energy Board (“OEB”) have put their final stamp of approval on the merger between ERTH Power Corporation (“ERTH”), formerly Erie Thames Powerlines Corporation, and West Coast Huron Energy Inc. (“Goderich Hydro”). The transaction will result in the merged company operating under one distribution license providing electricity service to 24,000 customers in 15 communities across four Southwestern Ontario counties. 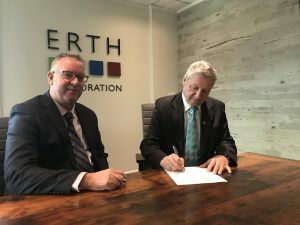 The deal has now been finalized after closing documents were signed earlier this week and plans to transition the merged utility to the ERTH brand have begun and expected to take a few months said Chris White President & CEO of ERTH Corporation. Goderich Hydro currently distributes electricity to customers in the Town of Goderich while ERTH provides electricity distribution to customers in Aylmer, Beachville, Belmont, Burgessville, Clinton, Dublin, Embro, Ingersoll, Mitchell, Norwich, Otterville, Port Stanley, Thamesford, Tavistock. ERTH Corporation is a diverse energy company that owns electricity distribution assets under ERTH Power Corporation as well provides energy services and solutions across North America through ERTH subsidiaries.